Everything in this book is uplifting, captivating, entertaining, engaging and even thrilling. 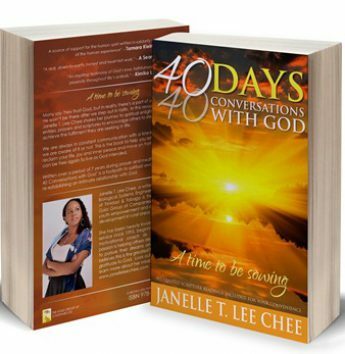 Janelle speaks her heart in a spirit of absolute faith and this faith book will challenge your body and soul to be the best as God intended. The book is now available at http://www.40daysbook.info . I would love to buy this book but an unable to because I get very little disability money. I am a licensed & ordained minister & was a speech therapist for 20 years until I was rear-ended by a Dodge Dually truck that had a steel grill on the front. The lady driving rammed me full force @ 40mph with the grill adding an extra 700 LBs of force She didn’t see me waiting to .turn because she had 5 unbuckled kids in there & she was trying to deal with them. My daughter was with me so as soon as impact happened, I turned to see how it affected.her. she has had back & knee problems from it but she didn’t break like me. Hello Jennifer! First of all we are sorry for what happened in your life. We wish you well and quick healing! This book will be a great resource for you and all people of the earth as a Faith resource and we will let you know about the decision after we communicate with the author, publisher and all stakeholders.